March is here and I am already enjoying seeing all the beautiful Spring designs papercrafters are making. We at ODBD are also gearing up for Spring with a stunning new release (here) and of course the challenge team has prepared some inspiring Spring themed challenges for you! 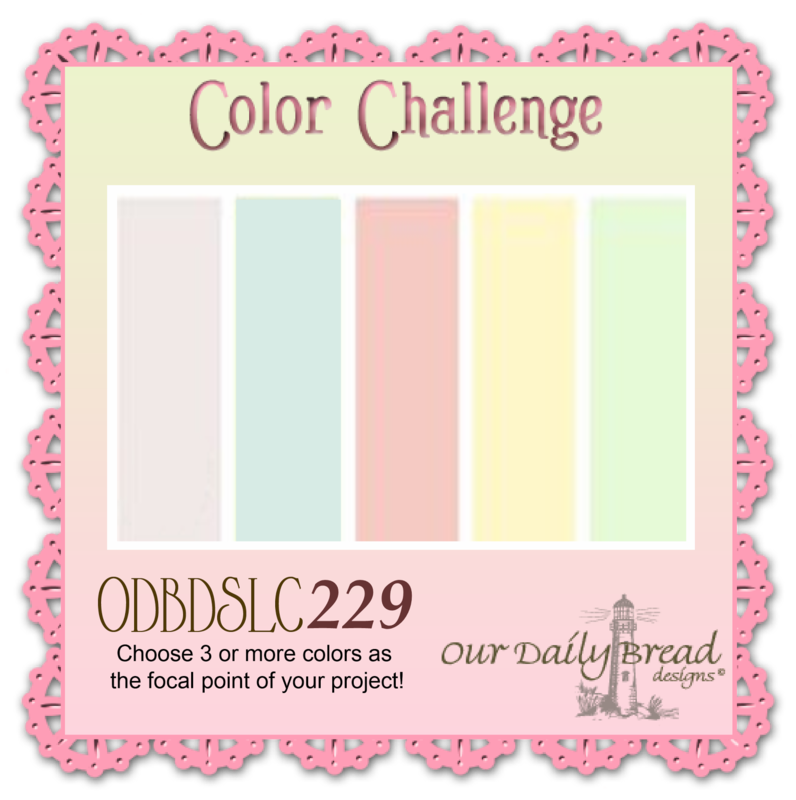 This week our challenge at ODBD is Pastel Colors. If you visit the blog often you know how much I love to use pastel colors on my cards, so I couldn’t wait to start making my card for today! I can’t wait to see what you create with this lovely color combo too! I created a background using the Beautiful Borders die set, die cutting different pastel colors and adhering them vertically. I like how delicate these borders look and how much texture they add to the card. I adhered a piece of pink ribbon accross the center to unify the colorful design. The color of ribbon that you add to the center becomes the predominant color and of course I wanted this soft pink to stand out the most and to tie the color combo together. I stamped and heat embossed in silver a sentiment from an older stamp set called Faith (which is one of my favorites) on white cardstock, that I then cut with a label die from Vintage Flourish Pattern. To add a Spring touch to the design I also heat embossed some butterflies from the same set on vellum, fussy cut them and add some around the label that I previously stenciled with coordinating pink ink. I hope you enjoyed today’s post and are inspired to join our challenge this week! To see all the projects created for ODBDSLC229 or to join the challenge click here. You have until March 8, 2015 at 8:00pm EDT to join us. By participating in the challenge, you have a chance to win a $15 ODBD Gift Certificate good towards the purchase of stamps in the “stamps column” on the ODBD website, or to be spotlighted on the ODBD Blog at our next challenge. The random prize winner will be posted on our next challenge post. Need more inspiration? Don’t miss the chance to visit my talented teammates to see what they created for the challenge! Thanks so much for stopping by today! See you again soon! You always have such a creative eye when putting together your layouts and designs, Gracie!! I just love the different colored border strips going vertically with the addition of the silver embossed butterflies. So elegant and just gorgeous my friend! Beautiful embossing of your sentiment and butterflies! I love the look of it! And don't ya just LOVE those borders? You have them in all those lovely pastels making this a wonderful springy card! Love all the dies with the piercing as well, adds so much to the detail! Beautiful my sweet friend! Gorgeous card, very creative and delicate! So funny how many of our cards have vellum this week! This is great – love your layers of the beautiful borders. Beautiful card. Great idea the way you layered the border strips. Beautifully done, Gracie!! I so love the Beautiful Borders, and your colors are so delicate! The embossed sentiment with the delicate bows make for a gorgeous card! Hugs! Stunning, lacy, and soft colors…love it! Thank you joining us at The Mod Squad Challenge! Graciellie, you did a fabulous job layering those dies. Beautiful colors too. Thank you so much for playing along with The Mod Squad Challenge this week. Love all of the texture and color on your background! I probably would not have thought of using the die as you did by introducing different colors and texture with the Beautiful Borders die. It looks so good!!! I think this is my favorite use of this particular die. You go girl!!! This is lovely, Gracie! Your stacked borders in all these pastels are just beautiful. So lacy & springy! Gorgeous card Gracie. Love how you think “out of the box” with the dies. Love the silver embossing too. Wonderfully done. Thank you for joining us at Crafty Sentiments.